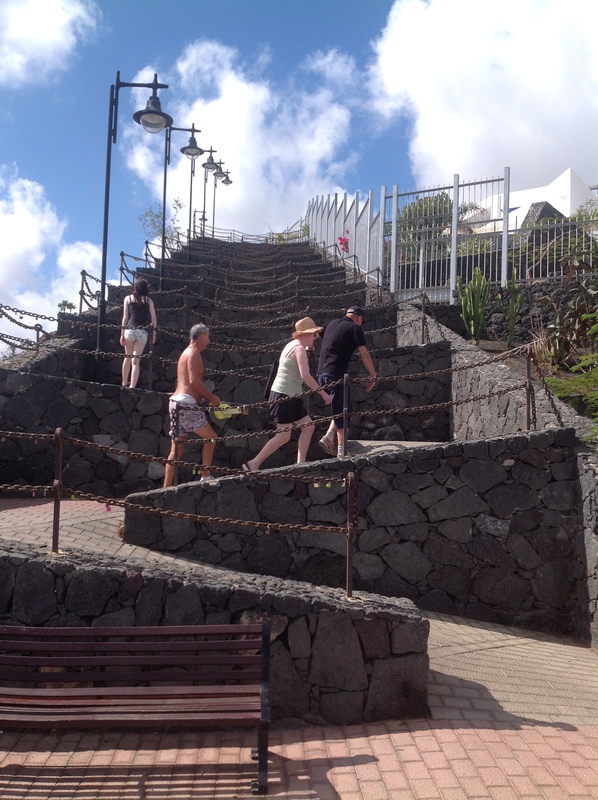 I have recently spent a glorious week in Puerto Rico in Gran Canaria rambling up hill and down dale, so to speak. This place is challenging enough and rambles in the early morning or after five in the evening are recommended. I hope I’m never there during an earthquake! We have been coming here now for the past ten years and each visit uncovers new delights, improved pathways, steps and roadways. 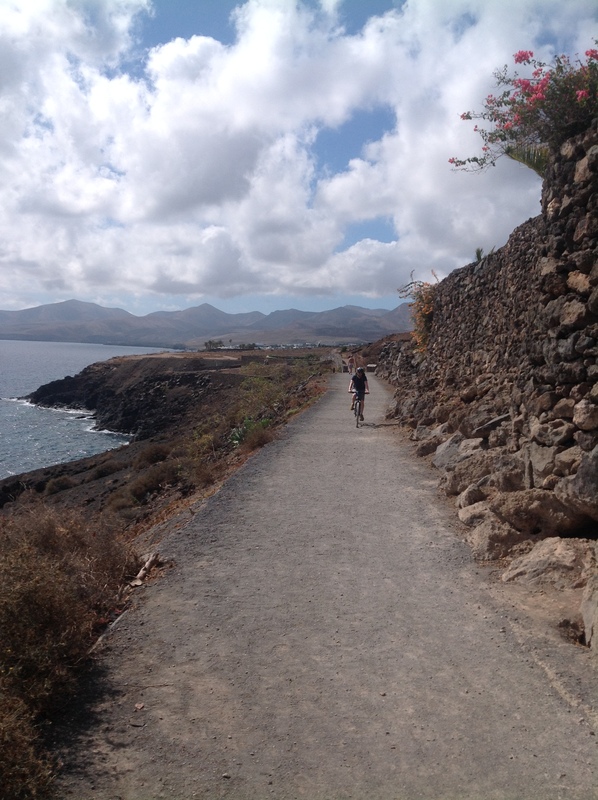 Our favourite walk is the Cliff Walk between Puerto Rico beach and the man-made Amadores Playa. This is an easy ramble and often a preamble to more strenuous excursions. We invariably book accommodation on the lower level, Corona Cedral would be our favourite place of all but we have also stayed in Monte Verde, Letitia del Mar, Maracaibo, Canaima and also Rio Piedras with its terracotta terraces overlooking the beach. All these are very central – near the main Shopping Centre and also the beach and its many restaurants. Our favourite restaurants are all on the beachfront. We’ve been evangelists for Oscar’s Restaurant for years and recently it seems to have amalgamated with its near neighbour Restaurante Aguaviva but I’m glad to report that the standards haven’t slipped – the most fantastic prawn cocktail, salmon, fillet steak, Crepes Suzette and all washed down with copious amounts of Marques de Caceres Crianza! The nearby El Greco apartment complex also has three restaurants which are worth a visit, especially La Cantina which is the best of the three El Greco options. The new kid on the block is Frank’s Gourmet Restaurant and after our one visit on this trip, it is guaranteed to keep the others on their toes! The only drawback I find with Puerto Rico is its distance from the airport – approximately 40 kilometres. However, Gran Canaria has a first class public transport system and once free of Arrivals and the terminal building you can go to the bus terminal and get the 91 bus to Puerto Rico for €5.45 – as opposed to €50 for a taxi. Alternatively, Ryanair and others provide reasonably priced shuttle services to and from the airport. As one becomes familiar with the area one becomes more confident in foraging out new trails, loops and challenging treks. The one thing to notice is that there are steps everywhere linking the various levels. 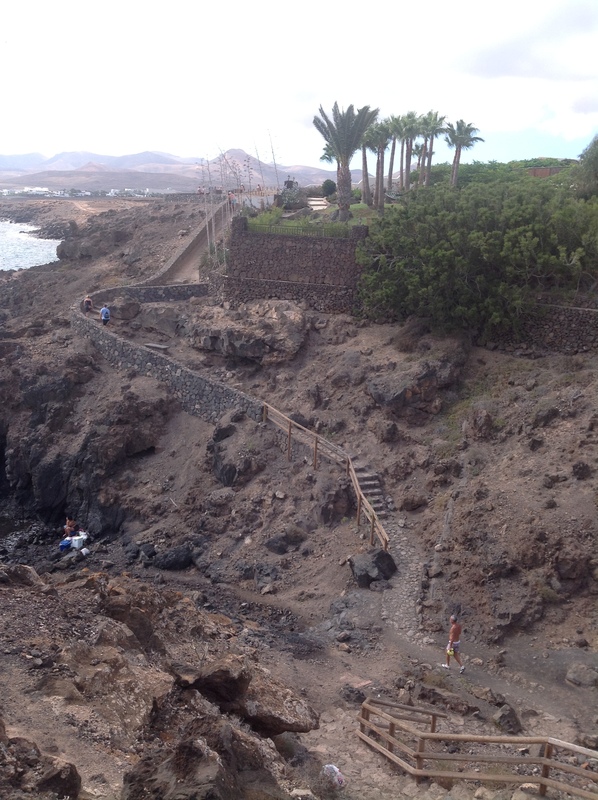 The local authority has done fabulous work in the past five years building a series of steps from the beach to the high point near Puerto Azul apartments. In all, there are 756 steps in this series – individually counted! – and depending on your exertions you can decide to descend the 756 or take on the more daunting challenge and ascend – or even decide to work both into your evening ramble! “Above all, do not lose your desire to walk. I walk myself into a state of wellbeing and walk away from every illness. I have walked myself into my best thoughts, and I know of no thought so burdensome that one cannot walk away from it” (A Letter to Henrietta Lund from Søren Kierkegaard, 1847, trans. Henrik Rosenmeier, 1978). In conclusion, I am often reminded of the lovely Latin phrase, Solvitur ambulando – ‘it is solved by walking’ – sometimes attributed to St. Jerome or Diogenes, or St. Augustine, maybe even Thoreau or Chatwin, inter alia….. So, put your best foot forward! A panoramic view of Puerto Rico beach and marina from on high! “El Varadero de la Tinosa”, is the original village of what is now the thriving Old Town centre of Puerto del Carmen. Today it is still a centre for fishing and there is a very strong seafaring tradition in the area. 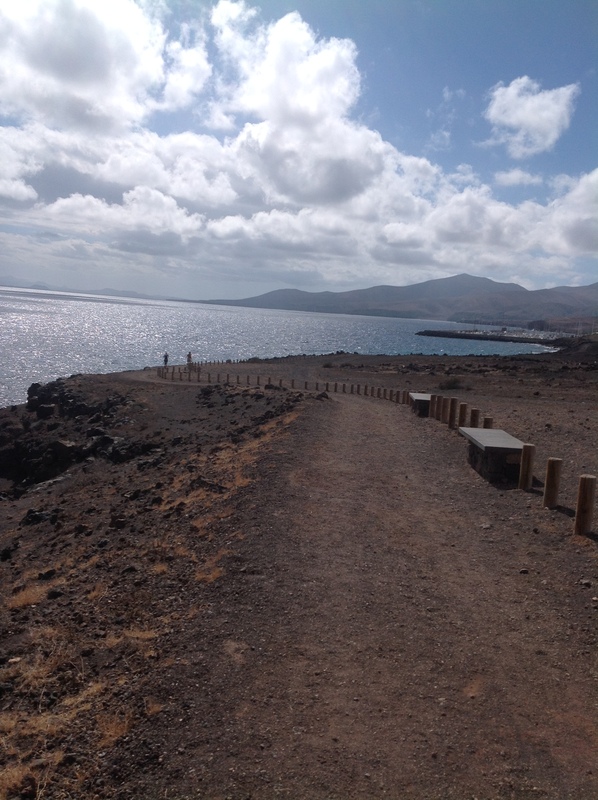 It is a centre for tourist trips and there is a regular hourly ferry plying between the port and Puerto Calero – the destination for our walk. We begin the walk in the port itself near the very distinctive Casa Roja restaurant at the beginning of the recently developed Boardwalk. Leaving Casa Roja we walk to the end of the boardwalk and take the steps at the end turning right. At the top we turn left along by the Aqua Marina apartments and go to the end where we again ascend some steps and veer left before ascending the recently constructed twenty switch-back steps to the newly paved area at the top. There are lovely views out to sea and many viewing areas along this stretch of the walk. Leaving “El Valadero de la Tinosa”, we walk south-east along the coast. The distance is 2.2 kms. approx and the walk, taken at a nice brisk pace, will take you about thirty minutes. The path now changes to a dirt track and runs above a small cliff that permits a glimpse from above, of the intertidal area, it’s coves and small inlets. We arrive at “The Barranco (ravine) del Quiquere”, of interest because it’s volcanic sides contain engravings from the indigenous world of the island of Lanzerote. 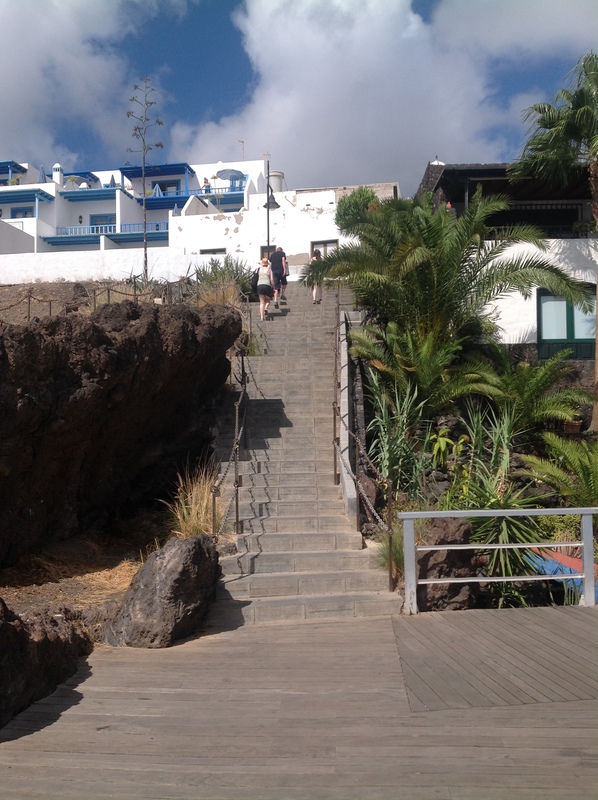 We can get a close look at them by taking the track just 50 metres to the north on the right side of the ravine as you walk from Puerto del Carmen. We cross down into the gorge and up the other side. It is also to be noted that this area is one of the two recognised nudist areas on the island so this may add some spice to your evening’s ramble! The views of the sea and islands of Lobos and Fuertaventura to the south enhance the beauty of the landscape in this area and eventually we arrive at the newly man-made marina of Puerto Calero. 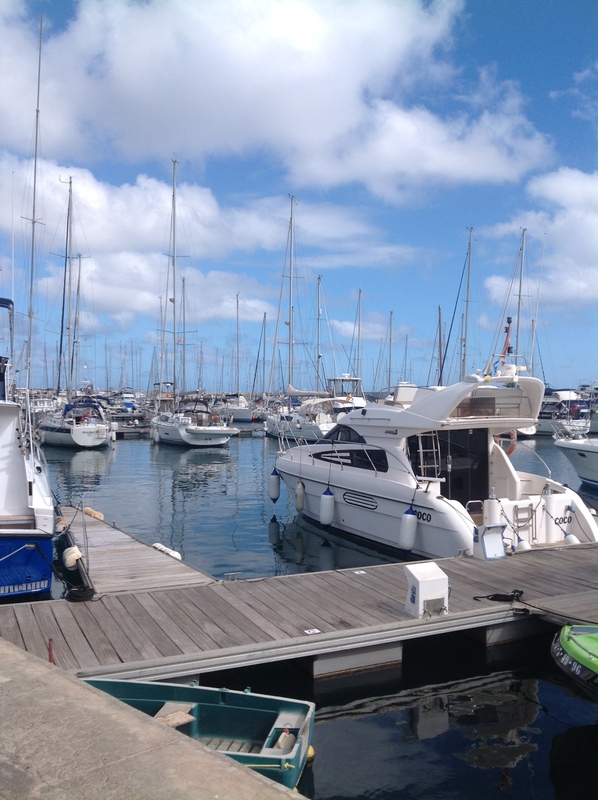 This beautiful port and marina is a fitting ending after our cliff walk and a ramble around the upmarket shops and outlet stores is highly recommended. There are also numerous high quality restaurants and at least two hotels nearby. Puerto Calero is renowned as a headquarters for some round the world yacht crews also and after a brief look around you will see why.